As soon as the American leader Donald Trump crossed the “equator” of his presidency, political life in the United States gradually began to shift to new presidential elections. In the camps of the Republican and Democratic parties, discussions are already under way for potential election participants scheduled for November 3, 2020. By the way, Trump himself has already announced that he will certainly take part in the campaign as a candidate from the Republican Party. As for the other Republican contenders, no one has expressed a public intention to nominate his candidacy, except for the current president. But the list of likely candidates is quite extensive. Among them are “veteran of election races”, 87-year-old American politician Jack Fellur, who has seven presidential campaigns, senators from Texas and South Carolina Ted Cruz and Tim Scott, former US representative to the UN Nikki Haley, Ohio Governor John Kasick and even Hollywood actor Dwayne Johnson. In the ranks of the Democratic Party, the Vice-President of the United States from 2009 to 2017, Joe Biden, has already announced his intention to run for the presidency. And the list of proposed candidates is even wider; it includes several US senators and governors, as well as former first lady Michelle Obama. Until recently, intrigue remained - whether Donald Trump’s rival in the 2016 elections, former US Secretary of State Hillary Clinton, would express her interest in the election campaign. And now, finally, the mystery was solved - Clinton, in an interview with journalists, admitted that she still wants to lead the United States. 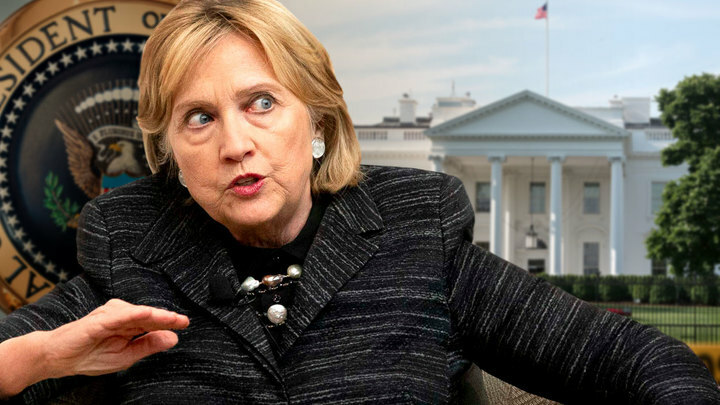 After the journalist asked the former secretary of state a direct question whether she intends to run for the Democratic party in the 2020 elections, Clinton hesitated, but then sincerely admitted that she still wanted to become president of the United States. The politician stressed that now the main goal for her is the victory of candidates from the Democratic Party in the mid-term elections on November 6, when 35 out of 100 senators and members of the full House of Representatives (435 seats) will be re-elected in the USA. Clinton also calls for the next US president to become a democrat. Recall that a year ago, Clinton categorically rejected the possibility of their participation in the next fight for the presidency. The politician admitted that she still suffers from a loss she did not expect, since she was sure that she was the undisputed favorite of the presidential race. Trying to justify his failure in the elections, the politician then accused Russia of interfering, then reproached the previous Democrat President Barack Obama, who, according to Clinton, damaged the Democratic Party’s rating by his unpopular economic policy. For the year past from these statements, apparently, peace came to her soul, and Clinton once again felt a taste for political struggle. If Hillary does not change mind again, the campaign of 2020 will be her third presidential race. Recall, for the first time, Clinton nominated her candidacy for the presidential election in 2008. But as a result of the scandal that erupted around her family, the former first lady lost to her party member Barack Obama in the primaries. However, then she finally got into the White House, taking the post of head of the American foreign affairs agency. Clinton made another attempt in 2016, becoming the most popular candidate from the Democratic Party. At the primary party of the Democratic Party, she bypassed an independent senator from the state of Vermont, Bernie Sanders, having won in 28 states, as well as all territories and in the District of Columbia. In the very elections that took place on November 8, 2016, Clinton lost to Republican Donald Trump. 306 electors voted for Trump, while only 232 electors voted for Clinton. However, in the number of voters represented by electors, Clinton still beat Trump by almost 2.9 million votes. The current US President Donald Trump has already stated that he is not at all against Clinton’s participation in the 2020 elections. According to the head of state, he is ready again, as in 2016, to “cross swords” with Hillary Clinton, and the head of the White House is confident that in 2020 luck will also be on his side. If Hillary Clinton really decides to represent the Democratic Party in the 2020 elections and wins the Democratic rivals' inner-party primaries, we will be able to witness the “remake” of the 2016 Trump-Clinton fight. But in the light of all the ambiguous political decisions that abound in the Donald Trump presidency, and the barrage of criticism both inside and outside the United States, the outcome of this struggle may be completely different.